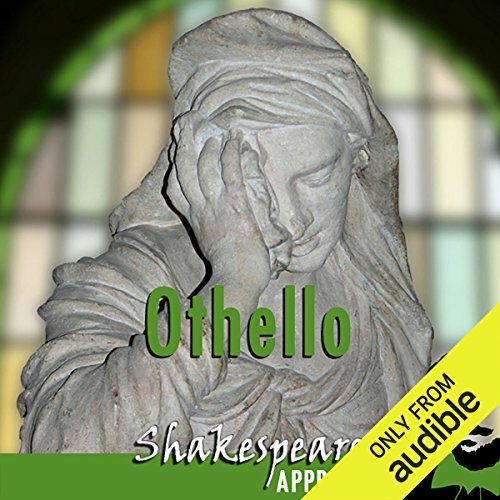 Undeniably one of Shakespeare’s best, Othello, is brought to life for a modern audience in this tremendously entertaining and award-winning audiobook by Jonathan Lomas and Phil Viner with a narration by experienced voice actors Joan Walker, Jude Akuwudike and Nick Murchie. Not only is Othello brought to listeners’ ears unabridged and with commentary included but voice notes on the historical background of the play are also given. Students and enthusiasts alike will revisit this celebrated play and be enlightened all over again to the master that was William Shakespeare. Available now from Audible. Experience Othello as a powerful full-cast drama with entertaining and enlightening commentary that explains what's what and who's who as the plot unfolds. I come from a computer science background. I have only recently begun to take an interest in literature. The historical context, definitions, and introductions are amazing. The commentary during dialog is extremely helpful in comprehension. Often times we glaze over certain dialog and don't really appreciate what was said. The commentary seems to anticipate these moments and brings us back into an analytical focus. After finishing the audio book I was very confident in my knowledge f the piece and could hold my own in a discussion with any literature student! Wonderful idea to give listeners the ability to choose between versions with or without commentaries. When I started listening to the version with commentaries, I was concerned that the commentaries might over explain the scenes and prevent me from appreciating the play from my own perspective. However, I listened on and was delighted to find that my worries were unfounded. The commentaries were copious and insightful enough to ensure effortless understanding of the context and language of the dialogue, but they did not preempt independent appreciation of the play overall. In sum, I enjoyed this audiobook and gladly recommend it. The Bard For the Rest of Us! We all know Shakespeare is arguably the greatest writer in the English language, but not many of us can appreciate his work due to its out-date/nearly-another-language English, but SmartPass comes to our aid with this and other fine translations of the Bard's works. You not only lively running commentary that explains what just happened, the jokes, and the nuances; you also get a wonderful production in the original language by and all-star full-cast, historical background and context, all the jokes explained, and much more. If you're looking to truly appreciate and enjoy Shakespeare, this series is for you! What did you love best about Othello? Excellent narration, informative background information, and superb performance. I learned a great deal, yet was thoroughly entertained. Though I thought I knew the play, the explanatory narrative gave me new insight into the motives of the characters. What other book might you compare Othello to and why? The final scene, when Iago got his comeuppance. I found this oral theatrical reading of the play, along with interspersed analysis ala Cliffnotes style, to be a fantastic way to consume Shakespeare. No more tedious cross referencing footnotes. No more struggling with the language. Just an entertaining reading of a fantastic play with a solid dose of background and history to expand one's appreciation of a genius' work. Good pace and good actors, though by the end, Othello sounded like he was extremely constipated instead of suffering from a broken heart. I thought having the commentary and explanations was a great idea, but I soon realized why it's optional: it is irritating. Too many close-together interruptions, it all sounded like she was telling the most inCREDible, asTOUNding, aMAZing (insert photo of astonished, eyes-popping-out narrator here) story to a four-year-old in order to keep his attention. Not nearly as effective as a more subdued, serious tone would have been. We bought the book, so we're already listening. This production of Othello is, for the most part, very well acted and excellent. The recording has the option to listen to the play "with commentary" or without, and while the idea of a "with commentary" production could have been a good one, it is marred by the need of the commenter to explain almost every line of the play. Not every line of Shakespeare is difficult or archaic and the reasonably astute listener can follow much of it without the interrupting explanation that breaks up the action. While some commenting on the more difficult passages is indeed quite useful, the benefits of those explanations are outweighed by the constant interruption of the flow of the play. For this reason, after the first two Acts I switched and listened to the without commentary section of the recording. Where there was something difficult to understand it was easy to pause the recording and find an explanation on-line. However, the actors who read the play did so beautifully and made me pleased to have purchased this recording. I have made three mistakes with Audible. Every time it was because I was persuaded by Paid-for Criticism. Never again. Insincere advertising is the root of all evil, HA! I have now been fooled thrice, so I am a confirmed idiot when it comes to getting audiobooks. This audiobook is a good idea but the irritating musical doodle should have undergone some mastering (it's as if they thought you were going to fall asleep so they blasted some middle-ages' heavy metal into your ear to wake you up and remind you that you were still in Venice...Thank you!!!! but no thank you...). The acting was dull and courageously anemic at best...enough said. I did not return this because I intend to listen to it again because of the good tidbits on history, too bad the acting was not to my tastes. I will however recommend this to anyone who wants to get into Shakey's world. There are some real gems of history polished throughout.